That of musicians injuries is becoming more and more a hot topic: you can find a lot of articles, books, specialists and doctors. They are considered a type of "repetitive strain injuries" (RSI), similar to those caused by the use of the computer or some sports. Nowadays everybody is well aware of this issue, there are even clinics and doctors specialized in musicians' injuries. They may cure the symptom but they don't really go into the details of how a musician can eliminate and prevent injuries while playing. I'm a musician myself and I'll share with you what I've learned about injuries related to string playing, particularly violin and viola. However, the causes of injuries and their cures are similar for most instruments players. I've learned from a musician, the person who was the first to talk about musicians injuries and stage fright, who has done a lifetime study of this problem and developed a solution, a way to play that doesn't cause injuries. This is the former child prodigy violinist Kato Havas, click the link to read more about her and the books she wrote about this. Back then, those books were ahead of their time, nobody spoke about physical injuries caused by playing an instrument. I myself did suffer from aches and pains, mainly in my neck and thumbs, although I never had any serious injury because I would stop playing as soon as I felt physically uncomfortable. Back then, before my "conversion", playing was much harder and I used to be very nervous (the things are connected). Any player can suffer from musician's injuries: beginners or advanced players, amateurs or professionals. However, for advanced students and professionals suffering from a tendonitis or other injuries is a serious problem. pain in the back of their neck, on the left side, caused by a tight violin hold and more by the viola hold. I met players who had developed problems in their jaws and teeth because of their hold. You can spot players with a tight hold by the callus under their left jaw. the second most common pain is in right, left or both thumbs. This is caused by squeezing the left hand especially when playing chords and in the the right hand by playing fast and gripping the bow stick with the fingers to hold it tight (for "safety") when playing fast and trying to play loud. pain inside the wrist, the carpal tunnel. pain in the right shoulder, often caused by hunching the right shoulder. Professional players and serious students are more at risk because they spend many hours a day every day playing their instruments, often playing very fast and demanding passages. An amateur violin player can afford to rest and recover, or give up playing altogether, even if reluctantly. But if you are a professional and have to make your leaving from performing an instrument you don't have this luxury. For this reason, professionals often don't say anything about their problem and keep playing despite the pain. They could miss jobs and money if they don't play. Maybe they ask their doctor, they take painkillers or cortisone injections, just to be able to keep doing their professional activity, while some even undergo surgery. However, this doesn't tackle the cause of the injury and I've met players who gave up playing altogether after surgery because they still had the same problem. Suffering from musicians injuries doesn't mean you are a bad player. Even very good performers get injured and have to stop playing, at least for some time, if they can afford it. I think many don't talk about this publicly because they feel for them it would be like admitting that there is something wrong in what they do, despite playing beautifully. An exception to this, because he didn't keep it secret, and a famous example of a career ended by an injury, was the viola player and pioneer Lionel Tertis who eventually stopped playing because of a bursitis in his right arm. He had been playing a very large viola for many years and wasn't a big man, so this strain had caused him great suffering. To understand how we get injured, we need to know something about how our body works, especially hands and arms for us string players. Our body is our instrument, all the rest is an accessory. Many players take almost more care with their violin, viola or other instrument than with their own bodies. They pay attention to the slightest extraneous noise in the instrument and then don't listen to their body: if there is pain, it is your body telling you that you are doing somehting that it doesn't like, it's not good for it. So, stop doing it. Have you ever seen an electric wire? Copper is surrounded by a plastic sheath. In a similar way, our tendons are surrounded by a sheath, and run inside it. This allows a smooth movement. When you hold something tight, this sheath squezes around the tendon to produce a solid grip, like when you need to carry a weight. When playing, if you squeze this sheath around the tendons by holding the bow tight and gripping with the left hand especially to play chords, and at the same time make a lot of fast movements, the tendons running inside their tightened sheath will cause a lot of friction and if you do this for long enough it will cause inflammation, pain and more serious problems. It seems just logical to me. 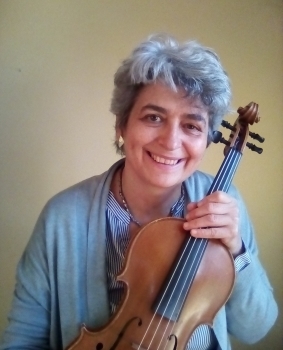 If you want to learn more about how to eliminate and prevent musicians injuries and improve your playing, read more about the Havas New Approach with videos, read the violin and viola books I recommend, watch the teaching DVD and get in touch. I also give online lessons with skype.